The Race: Today was a stage with some bumps, but nothing like the previous two stages. 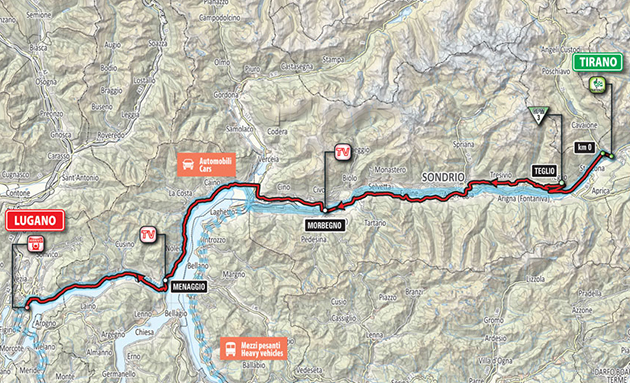 Early on a trio of Marco Bandiera, Giacomo Berlato and Iljo Keisse escaped the pack, but never built a substantial lead. With about 30 kilometers remaining they were rounded up. Then several other breaks were attempted, but come time for the sprint, all were caught. 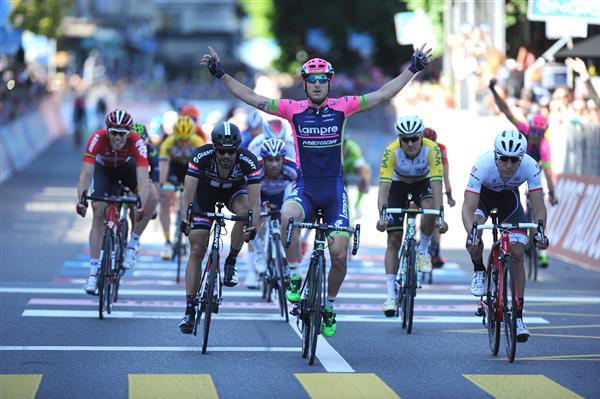 Lampre-Merida played it perfectly, launching Sacha Modolo to win his second stage this Giro (he also won stage 13). The GC boys all stayed safely tucked into the peloton with no changes to the top ranks of the standings. 2 NIZZOLO Giacomo TREK s.t. 3 MEZGEC Luka GIANT-ALPECIN s.t. 4 HAUSSLER Heinrich IAM CYCLING s.t. 5 APPOLLONIO Davide ANDRONI GIOCATTOLI s.t. 6 BROECKX Stig LOTTO-SOUDAL s.t. 7 LOBATO Juan Jose MOVISTAR s.t. 8 PORSEV Alexander KATUSHA s.t. 9 REZA Kevin FDJ s.t. 10 VAN DER LIJKE Nick LOTTO NL-JUMBO s.t. 11 VIVIANI Elia SKY s.t. 12 RICHEZE Ariel Maximiliano LAMPRE-MERIDA s.t. 13 GENIEZ Alexandre FDJ s.t. 14 COLBRELLI Sonny BARDIANI-CSF s.t. 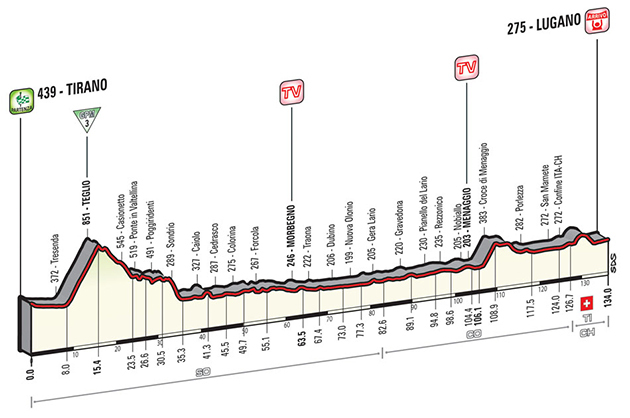 16 PETACCHI Alessandro SOUTHEAST s.t. 17 MONTAGUTI Matteo AG2R-LA MONDIALE s.t. 18 KONIG Leopold SKY s.t. 19 GILBERT Philippe BMC s.t. 22 MORI Manuele LAMPRE-MERIDA s.t. 23 CONTADOR Alberto TINKOFF-SAXO s.t. 25 ROGERS Michael TINKOFF-SAXO s.t. 26 DILLIER Silvan BMC s.t. 27 LAGUTIN Sergey KATUSHA s.t. 29 LANDA MEANA Mikel ASTANA s.t. 30 SANCHEZ Luis Leon ASTANA s.t. 31 KANGERT Tanel ASTANA s.t. 32 GROSU Eduard Michael NIPPO-VINI FANTINI s.t. 33 TIRALONGO Paolo ASTANA s.t. 34 AMADOR Andrey MOVISTAR s.t. 35 CATALDO Dario ASTANA s.t. 36 KRUIJSWIJK Steven LOTTO NL-JUMBO s.t. 37 NIEVE ITURALDE Mikel SKY s.t. 38 VAN DEN BROECK Jurgen LOTTO-SOUDAL s.t. 39 TROFIMOV Yury KATUSHA s.t. 40 BETANCUR Carlos Alberto AG2R-LA MONDIALE s.t. 41 BEWLEY Sam ORICA-GREENEDGE s.t. 43 FORMOLO Davide CANNONDALE-GARMIN s.t. 44 VAN POPPEL Boy TREK s.t. 45 HESJEDAL Ryder CANNONDALE-GARMIN s.t. 46 CHAVANEL Sylvain IAM CYCLING s.t. 48 BOUET Maxime ETIXX-QUICK STEP s.t. 49 GRETSCH Patrick AG2R-LA MONDIALE s.t. 50 FELLINE Fabio TREK s.t. 52 SLAGTER Tom Jelte CANNONDALE-GARMIN s.t. 54 FINETTO Mauro SOUTHEAST s.t. 55 CARDOSO Andre Fernando CANNONDALE-GARMIN s.t. 57 BEPPU Fumiyuki TREK s.t. 58 HANSEN Adam LOTTO-SOUDAL s.t. 59 BAK Lars Ytting LOTTO-SOUDAL s.t. 60 MARANGONI Alan CANNONDALE-GARMIN s.t. 61 ATAPUMA Jhon Darwin BMC s.t. 62 CHAVES Johan Esteban ORICA-GREENEDGE s.t. 63 PUCCIO Salvatore SKY s.t. 64 ELISSONDE Kenny FDJ s.t. 65 HENAO Sebastian SKY s.t. 66 PELLIZOTTI Franco ANDRONI GIOCATTOLI s.t. 68 PIRAZZI Stefano BARDIANI-CSF s.t. 70 NOCENTINI Rinaldo AG2R-LA MONDIALE s.t. 71 NIEMIEC Przemyslaw LAMPRE-MERIDA s.t. 72 GAVAZZI Francesco SOUTHEAST s.t. 73 KREUZIGER Roman TINKOFF-SAXO s.t. 74 MONSALVE Jonathan SOUTHEAST s.t. 75 ROSA Diego ASTANA s.t. 76 HERRADA Jesús MOVISTAR s.t. 77 DE NEGRI Pier Paolo NIPPO-VINI FANTINI s.t. 78 FAVILLI Elia SOUTHEAST s.t. 80 PAOLINI Luca KATUSHA s.t. 82 DURBRIDGE Luke ORICA-GREENEDGE s.t. 84 DE LA CRUZ David ETIXX-QUICK STEP s.t. 85 BOOKWALTER Brent BMC s.t. 86 BISOLTI Alessandro NIPPO-VINI FANTINI s.t. 87 KEIZER Martijn LOTTO NL-JUMBO s.t. 88 CUNEGO Damiano NIPPO-VINI FANTINI s.t. 89 DOMONT Axel AG2R-LA MONDIALE s.t. 91 ULISSI Diego LAMPRE-MERIDA s.t. 93 ROUX Anthony FDJ s.t. 94 MOUREY Francis FDJ s.t. 95 BÉRARD Julien AG2R-LA MONDIALE s.t. 97 PATERSKI Maciej CCC SPRANDI POLKOWICE s.t. 99 BASSO Ivan TINKOFF-SAXO s.t. 100 ALAFACI Eugenio TREK s.t. 101 ZILIOLI Gianfranco ANDRONI GIOCATTOLI s.t. 102 COURTEILLE Arnaud FDJ s.t. 104 SIUTSOU Kanstantsin SKY s.t. 107 BOARO Manuele TINKOFF-SAXO s.t. 108 TJALLINGII Maarten LOTTO NL-JUMBO s.t. 109 ZEITS Andrey ASTANA s.t. 110 MALACARNE Davide ASTANA s.t. 111 CHERNETSKY Sergey KATUSHA s.t. 112 SARAMOTINS Aleksejs IAM CYCLING s.t. 114 KOCHETKOV Pavel KATUSHA s.t. 117 FERNANDEZ Rubén MOVISTAR s.t. 118 BELKOV Maxim KATUSHA s.t. 119 OWSIAN Lukasz CCC SPRANDI POLKOWICE s.t. 120 ZARDINI Edoardo BARDIANI-CSF s.t. 121 ANTON Igor MOVISTAR s.t. 122 SABATINI Fabio ETIXX-QUICK STEP s.t. 123 VAKOC Petr ETIXX-QUICK STEP s.t. 124 KIRYIENKA Vasil SKY s.t. 126 STORTONI Simone ANDRONI GIOCATTOLI s.t. 127 TVETCOV Serghei ANDRONI GIOCATTOLI s.t. 128 VEIKKANEN Jussi FDJ s.t. 132 GESCHKE Simon GIANT-ALPECIN s.t. 133 PAULINHO Sergio Miguel TINKOFF-SAXO s.t. 134 EISEL Bernhard SKY s.t. 135 JUUL JENSEN Christopher TINKOFF-SAXO s.t. 138 FRAPPORTI Marco ANDRONI GIOCATTOLI s.t. 139 MALAGUTI Alessandro NIPPO-VINI FANTINI s.t. 140 FISCHER Murilo Antonio FDJ s.t. 141 LANCASTER Brett ORICA-GREENEDGE s.t. 142 PINEAU Jérôme IAM CYCLING s.t. 144 DE BACKER Bert GIANT-ALPECIN s.t. 145 STAMSNIJDER Tom GIANT-ALPECIN s.t. 147 COLEDAN Marco TREK s.t. 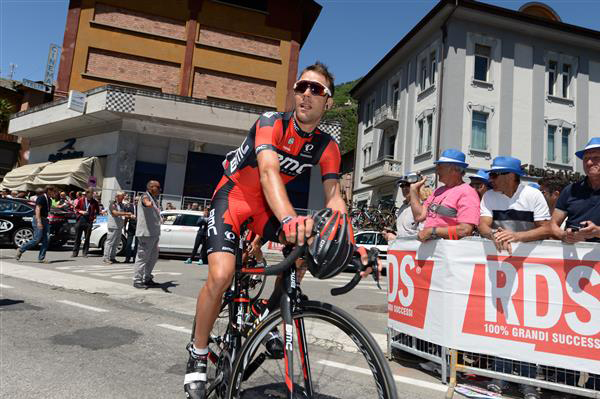 149 STACCHIOTTI Riccardo NIPPO-VINI FANTINI s.t. 150 WATSON Calvin TREK s.t. 151 SAMOILAU Branislau CCC SPRANDI POLKOWICE s.t. 152 MATYSIAK Bartlomiej CCC SPRANDI POLKOWICE s.t. 153 FLENS Rick LOTTO NL-JUMBO s.t. 154 ARMEE Sander LOTTO-SOUDAL s.t. 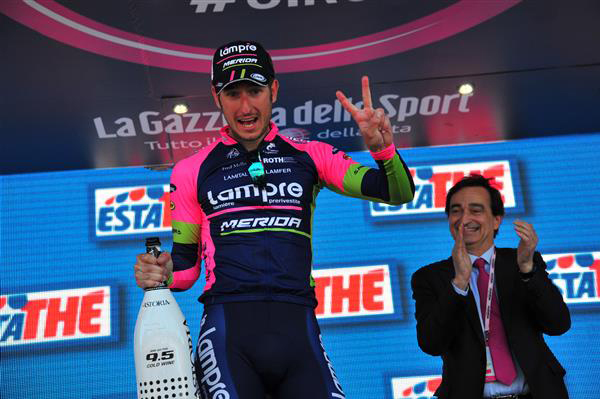 155 GRMAY Tsgabu LAMPRE-MERIDA s.t. 156 ACEVEDO Janier Alexis CANNONDALE-GARMIN s.t. 157 BERLATO Giacomo NIPPO-VINI FANTINI s.t. 158 BATTAGLIN Enrico BARDIANI-CSF s.t. 159 KEISSE Iljo ETIXX-QUICK STEP s.t. 161 ZAKARIN Ilnur KATUSHA s.t. 162 BANDIERA Marco ANDRONI GIOCATTOLI s.t. 163 MIHAILOV Nikolai CCC SPRANDI POLKOWICE s.t. 164 HOFLAND Moreno LOTTO NL-JUMBO s.t. 165 FAIRLY Caleb GIANT-ALPECIN s.t. 166 CHENG Ji GIANT-ALPECIN s.t. 167 BOEM Nicola BARDIANI-CSF s.t. Giant-Alpecin rider Ji Cheng heads to the start. 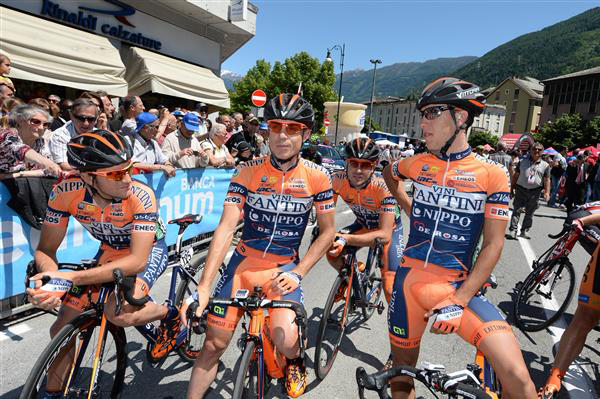 The Nippo-Vini Fantini boys are lined up and ready to race. 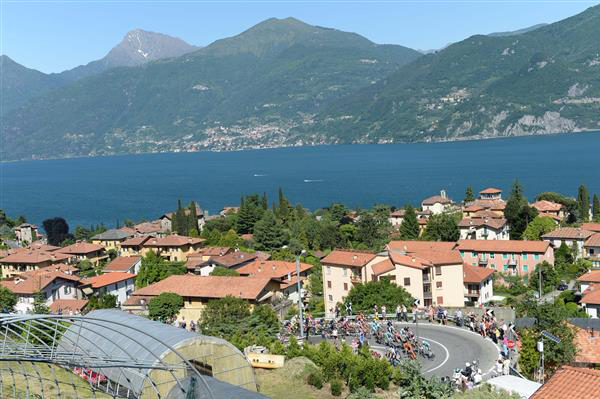 After some of the bad weather the Giro has suffered through, this was a lovely day for a bike race. 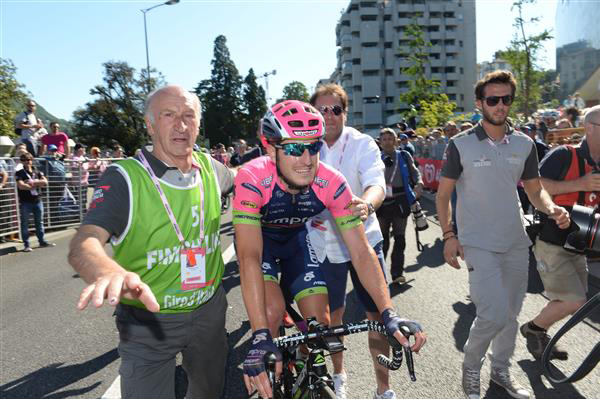 An official guides Sacha Modolo after his stage win. 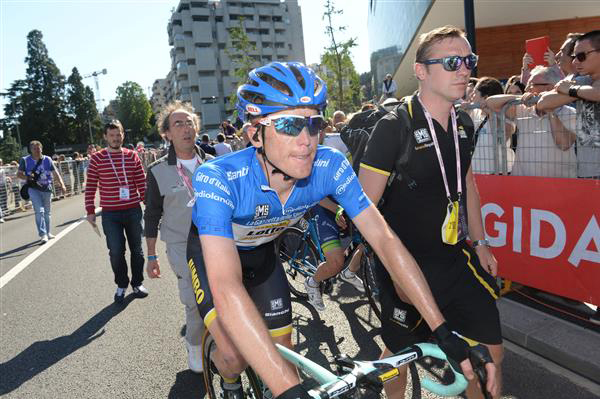 Steven Kruijswijk finished the stage in good order. Sacha Modolo enjoys his stage win. 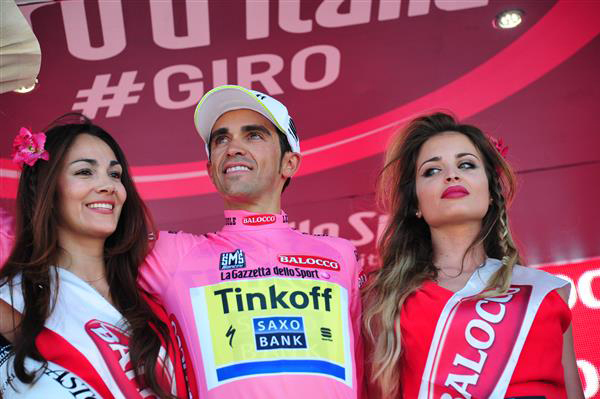 It's looking like Alberto Contador has a rather firm grip on the pink jersey. 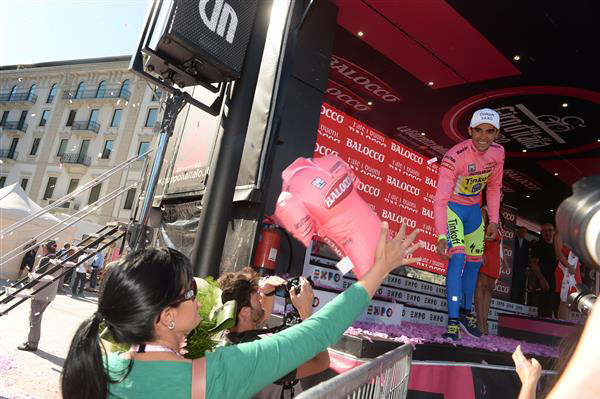 Contador tosses a fan a souvenir.